Octopus is a favourite in many cuisines, so there's been plenty of competition for best cepholophod dish in Hong Kong this year. But our pick is at 121BC. In true Mediterranean fashion, the octopus here is both creamy-tender and intensely flavourful. The venue changes its menu periodically so there's different versions of the seafood – but it's always awesome. Call ahead and ask what they've got on. $150. 42-44 Peel St, Central, 2395 0200; 121bc.com.hk. This fine French restaurant, by founder and chef Akrame Benallal, opened a year ago to five-star applause from us. It's designed around a menu that changes every month, so you'd think the lobster here couldn't stay consistently outstanding – but it does. This season, Benallal offers lobster with hot consommé and celery – a tantalising combination that shows off both the expertise of the servers who cook it to perfection at your tableside and the ingenuity of the chef. Six-course lunch is $580. 9 Ship St, Wan Chai, 2528 5068; akrame.com.hk. The original tearoom in Paris was once a place where the intelligentsia like Proust and Coco Chanel rubbed shoulders. Now it's also on the third floor of the IFC. Apart from its world famous hot chocolate and Mont Blanc dome, this year we've fallen for its cheesecake. The apricot confit adds a sharp tang to the cloud-like cake and it's all rounded off by a crunchy shortbread and madeleine biscuit base. Dessert decadence! $75. Shop 3031-3070 & 3025-3026, IFC mall, 8 Finance St, Central, 3188 0842; ifc.com.hk. Rich, crispy, juicy and bursting with flavours, the short ribs at Gordon Ramsay's new BSK in Hong Kong are a definite highlight of the year. Cooked for 16 hours and then pan-fried crisp before being glazed with honey, these beauts really are out of this world. Experience the crackle on your tongue before you break into the soft, tender, rich, flavoursome meat. $198. M/F, LKF Hotel, 33 Wyndham St, Central, 2230 1800; diningconcepts.com. year but the classic at The Butchers Club Burgers just edges it. With dry-aged black Angus beef patties made to order, Canadian streaky bacon, plenty of melted mature cheddar cheese, a perfectly toasted bun and a signature tangy onion spread, this is the king of 2014 for us. $100. G/F, Rialto Bldg, 2 Landale St, Wan Chai, 2528 2083; butchersclub.com.hk. Ms B's cakes are works of art that are almost too good to eat, and our favourite flavour this year is the Chocolate Nuts 'n Nougat Cake. Made by Ms B's Cakery and available at both of the elegant C'est la B cafés in Harbour City and Pacific Place, it's deliciously topped with crunchy goodies and dripping with chocolate, this cake deserves all the praises we can give. Every bite is packed with pistachios, almonds, hazelnuts, and meringue, all buried among the sponginess of a creamed cake. $720. Available at various locations inc 39 Gough St, Central, 2815 8303; msbscakery.hk. Pork dumplings can only be done so many ways but Dragon-i's take on this classic is sure to make your taste buds snap, crackle and pop. Fried twice (first pan-fried and then deep-fried) to lock in all the juices, the Beijing dumplings at this club are crispy-golden on the outside and soft and juicy on the inside. A great addition to its relaunched dim-sum lineup that's got us roaring with appreciation this year! All you can eat dim-sum is $218. Podium, The Centrium, 60 Wyndham St, Central, 3110 1222; dragon-i.com.hk. Sure, the coffee is the signature offering at Elephant Grounds but the limited-production ice cream sandwiches have got us all gooey this year. Not only are these special snacks exclusively available at weekends, supply is restricted to just 30 to 50 sarnies. What makes these desserts so special are the wafer-thin cookies that sandwich the ice cream. The yield is especially fickle on these babies. Make sure to stomp over early on a Saturday to get hold of one. $68. 11 Gough St, Sheung Wan, 2253 1313; facebook.com/elephantgrounds. Of course it's the super infra-red grill that makes all the difference at Enmaru izakaya, which opened in the spring. You just can't keep your eyes away from the glowing long embers as soon as you walk in. We think the fish in particular benefits the most from this unique grilling technique. The 900-degree heat locks all the juices in before crisping up the skin to perfection. You can select any fish under the rising sun but our favourite is the tiger garoupa due to its supremely mild flavour, easy texture and affordability. $398. Shop 1001A, 10/F, Times Square, 1 Matheson St, Causeway Bay, 2721 9955. The standout dish at this haute Japanese-Italian dining venture that opened in Causeway Bay in the summer is the abalone daikon, which features a slice of winter radish sitting in a shell like a translucent gemstone. Despite its simple appearance, it's infused with a fragrant dashi broth and tastes divine in itself. However, the true star of the dish is the lightly sauced abalone that holds a perfect consistency. Truly a gastronomical masterpiece. $138. 2/F, 15-21 Sharp St E, Causeway Bay, 2153 3136; francescobyfranck.com. Argentinian steak gets the star treatment at this newly opened British-imported concept restaurant. And none of the cuts come as juicy or as tender as the churrasco de lomo: a spiral-cut fillet that's marinated in garlic and parsley for 48 hours, then grilled and turned only once to seal the juices in. This produces an extraordinary strip of meat that bursts with flavour and melts in the mouth. $498. 5/F, LHT Twr, 31 Queen's Rd C, Central, 2386 8090; gauchorestaurants.com.hk. The flavourful tomato and basil sauce underneath a plump, juicy claw of lobster makes this tagliolini a winner in our books. Former head chef of Nicholini's at the Conrad Hong Kong, chef Giovanni Greggio, takes pride in using traditional Italian techniques and flavours at Gradini Ristorante E Bar Italiano, which opened at The Pottinger Hong Kong in the autumn, and his passion shines through in this exemplary best-of-the-year pasta. $360. The Pottinger Hong Kong, 74 Queen's Rd C, Central, 2308 3088; thepottinger.com. Contrary to the dropping mercury, ice cream is the hot item this winter and Korean chain Honey Creme is certainly creative when it comes to pairings. There's the fluffy cotton candy affogato and the swirl of ice-cream with kernels of sweet popcorn that are ace, but what we're really addicted to is the simple soft serve with a shard of honeycomb on the side. The sweet honey flavours that collide with the creamy soft serve keeps us coming back for more. $42. 34 Lee Garden Rd, Causeway Bay, 3525 1264; honeyicecream.com.hk. Traditional French dining finds a home at Jules Bistro, which only opened in Happy Valley a couple of weeks ago but has already proved itself as one of the hits of 2014. One of chef Laurent Brouard's masterpieces is the duck confit – a slow-cooked delicately balanced dish that's neither too salty, nor gamey, nor oily. To top it off, the skin is pan-fried to a delicate crisp, making this one of the best variations of this French classic we've ever had. $168. G/F, King-Inn Mansion, 13-15 Yik Yam St, Happy Valley, 2838 1115; bistrojules.com. When steak frites is the only item on a menu, you're guessing it must be good, right? And it is parfait at Le Relais de l'Entrecôte, another new arrival in the past couple of months. The pairing of juicy cuts of prime beef with a smooth, buttery 'secret' sauce is a match made in heaven, and the aromatic spices are so well-blended that you'd be hard-pressed to tease them apart. All we can do is sit back, tuck in and enjoy this savoury marvel. $288. 1/F, Garden East, 222 Queen's Rd E, Wan Chai, 2891 9080; relaisentrecote.hk. 46 Wyndham St, Central, 2881 8901; mamasanhongkong.com. Anything fried and containing Nutella can't be half bad. But these pearls at Man Mo Café exceed our expectations. The little glutinous rice balls are covered in sesame seeds and are full of warm chocolatey goodness. Man, how come it took so long for someone to come up with such an amazing combination? $20. 40 Upper Lascar Row, Sheung Wan; 2644 5644; facebook.com/manmocafe. By using the best ingredients from around the world, Mott 32 creates some outstanding dishes. Our favourite at this 'East meets West' eatery is the stir-fried prawns that come in a light and crackly batter. There's a dollop of pumpkin and salty egg yolk paste on top of them that elevates this otherwise traditional fried dish to a whole new level. $280. Basement, Standard Chartered Bldg, 4-4a Des Voeux Rd, Central, 2885 8688; mott32.com. Rendang beef meets char siu bao at Mrs Pound and creates a taste extravaganza. This bao is not only a cheap eat but a great one too. The tender curried beef is lathered in tangy char siu sauce, which is effortlessly encased in a light and fluffy white bun, making for one of the best baos in town. It gets mind-blowingly better by the mouthful! $45. 6 Pound Ln, Sheung Wan, 3426 3949; mrspound.com. Thai food is innovatively ramped up at this waterfront restaurant that opened a year ago. And no visit to Namo is complete without ordering the signature XLO, which stands for 'extra-large octopus'. 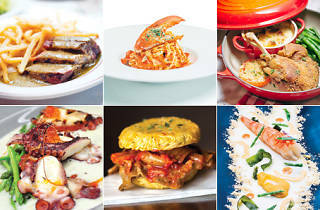 Yeah, so this is our second mention of octopus in our top 30 but it really deserves its place. Though the dish is traditionally made with Spanish herbs, Namo's variation chargrills the mollusc until it's tender before drenching it in a lemongrass and coconut foam. Perfect for sharing with the family. $168. Shop G18, Empire Ctr, 68 Mody Rd, Tsim Sha Tsui East, 2739 1133; mayfare.com.hk. Gaining a Michelin star barely into its first year, Nur has been a success story. And the ingenuity of chef Nurdin Topham needs no introduction. Known for his skill in bringing out the best flavours from his top quality ingredients, our pick of 2014 is his rendition of the wagyu beef cheek. Soft and tender, this cut is the most consistent and flavourful we've ever eaten. The menu changes regularly at Nur, so call ahead to see if this dish is on the menu. $788. 3/F, Lyndhurst Twr, 1 Lyndhurst Tce, Central, 2871 9993; nur.hk. This dish at summer newcomer Seasons by Olivier E is like a basket of heaven for crab lovers. There are five variations of the seafood in it, including our fave, the classic chilled crab-bite, which is sweet, succulent and rich, and sports a delicious briny flavour. The crispy tempura-fried crab is also a winner, as are the crab salad wrap, which uses a decent touch of ginger, the crab salad that utilises tartar sauce and the buttery crab. We've been crawling back for more. A lot. $228. Shop 308, 3/F, Phase 2, Lee Gardens, 2-38 Yun Ping Rd, Causeway Bay, 2505 6228; seasonsbyolivier.com. Prepare yourself for one of the best renditions of trendy food truck item – the ramen burger – you'll ever have. Street Meat serves up a burger bun made out of ramen that's filled with wagyu beef bulgogi and plenty of spicy kimchi. The crispy outside and soft, chewy inside create a taste sensation. We love the consistency of the bun that holds firm until the last bite. $68. 50 Wyndham St, Central; facebook.com/streetmeat.hk. This restaurant is famous for its three-sliced toro sushi. This year, though, we've fallen in love with the thin kelp-wrapped uni sushi at Rozan as it prolongs the briny sweetness of the superior fleshy mollusc on the palate. What's in the lineup for the lunch and dinner sets at this 12-seat eatery are subject to chef Masataka 'Masa' Fujisawa, so call ahead to make sure this delight is on the menu. $200. Shop 2, G/F, The Oakhill, 18 Wood Rd, Wan Chai, 2574 1333; ginsai.com.hk. Japanese tapas fills the menu at this izakaya that opened a year ago – and the one tapa to rule them all is the uni-spiked tofu. This beautiful dish is presented in a flat bowl with uni, dashi – Japanese soup stock – jelly, bonito flakes and ginger stacked artistically atop a bed of homemade tofu. Why does it work so well? The dashi jelly acts as a conduit for the other flavours and, with the ingredients playing off each other, you get a different texture with every spoonful. $158. 20 Po Hing Fong, Sheung Wan, 2547 2833; tabibito.com.hk. The top-of-the-line A5 supreme kobe beef sirloin at this sleek and chic teppanyaki thrills even the most fastidious of beef aficionados. After you take a piece of that medium-rare goodness into your mouth, you swoon as the fat melts on your tongue. The beef is fragrant, full of rich flavours and tastes as luxurious as the price. $1,420. 1/F, Hollywood Ctr, 77-91 Queen's Rd W, Sheung Wan; 3568 7788; facebook.com/hksushiginzaonodera. It's been a big couple of months for Wan Chai gastropub-in-a-heritage building The Pawn as it's been renovated, redesigned and re-imagined. But the overhaul has been a total success – as has the fab duck liver parfait. This dish perfectly embodies the new-look venue – classic British with an elegant twist. Layered pâté, rillettes and crispy skin all seasoned with a five-spice mix combine to make a rich-yet-surprisingly delicate starter. Slather it all on some of the crispy toast that's artfully served on top of some chicken wire, you can prepare to make your taste buds dance the light fantastic. Unconventional cuts of chicken are the norm at this fairly new Japanese eatery but we're most enamoured with the root of chicken tail on a skewer. It's made up of the parson's nose and a fatty layer of skin that's hanging off the end. Yeah, many would think this is a fowl cut of the bird but it's actually supremely flavourful and grilled to a crisp finish here. Our most unusual-yet-satisfying bite of the year. You'll thank us for converting you to beak-to-tail dining. Seven-course meal is $288. 2 Glenealy, Central, 2388 7717; toritama.hk. This Spanish fine dining institution made quite a splash in the summer when it impressed the crowds at the newly opened PMQ with its Basque cuisine. Our favourite ever since has been the red Palamos prawn starter that sees the seafood served alongside sea urchin on a seabed of crustacean-flavoured mayonnaise. Exemplifying the Basque's seafaring heritage, you really do go on an oceanic journey with every bite. $430. 7/F, Block B, PMQ, 35 Aberdeen St, Central, 2156 0888; vasco.com.hk. A medley of sweet and savoury, the duck ham salad at Watermark incorporates Jerusalem artichokes, squid ink, yuzu vinegar and sardines, which all marry the aroma of the cured duck ham and produce a refreshing symphony of flavours. When eaten in front of one of the best oceanic views in town, this dish has to be one of our real favourites for the whole of 2014. 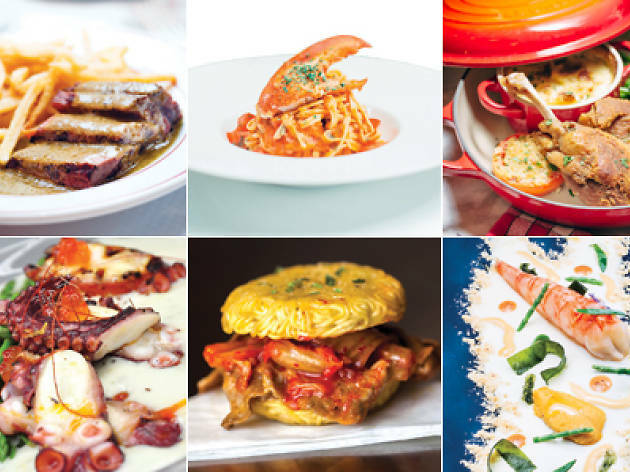 An epic year of dining. $178. Shop L, Level P, Central Pier 7, Star Ferry, Central, 2167 7251; cafedecogroup.com. Hong Kong's best-known celebrity chef has been busy in 2014 but he says he's nevertheless taken the time to enjoy the pan-seared frog's legs at Seasons by Olivier Elzer. "Overall, it's very good," says the Demon Chef. "It's cooked with a combination of poulette sauce and yellow wine, with some spelt risotto. The frog is very tender and perfectly done." Leung's only got the best things to say about one of this year's hottest Hong Kong openings. "There are many nice dishes at Seasons but this one is the best." The head chef at Central social club, dance haven and restaurant Bungalow, Steve Chou, is new to the fragrant harbour, hailing from New York. But he's already found his favourite dish on the steep steps of Elgin Street at a little joint called Leaf Dessert. It's the wonton noodle soup here that's kept him coming back. He says: "The noodles are soft and the soup base is strong and concentrated. I can eat this three or four times a week." The culinary genius and owner of Peel Street Vietnamese paradise Chôm Chôm goes just a few doors along the road for his favourite dish of the year – steak-frites from La Vache. Using top quality, organic, grassfed meat, it's no wonder that former top banker Franklin raves about this dish, which he likes to enjoy with a glass of red wine. "La Vache does one thing and it does it better than anyone else in town," says Franklin, frankly.